BenQ (officially) announce W2700 4K projector with most of what you've been wishing for in a low cost 4K projector. Check out the W2700 & W5700 both finally here for April 2019. The BenQ W5700 is a larger projector at a very reasonable price that's going to look and perform like a real beast in any home cinema. The 2 new BenQ projectors are tipped to be in short supply as production ramps up over the next few months. "..Building on this, the $2,499 W2700 can reproduce 100% of the Rec. 709 HD/Blu-ray colour gamut and 95% of the DCI/P3 colour gamut used in 4K UHD and commercial cinema. Stepping up to the W5700 brings both 100% of Rec. 709 and DCI/P3 colour gamuts. At $3,999, the W5700 is to the best of my knowledge, the cheapest projector on the market that can reproduce full DCI-P3 colour." New 4K projectors offer Double the size, 1/250th the price! The PX727-4K is the True 4K buy of the month, if not the year. Full 3 Year Warranty too! Mention Home Cinema Central when booking your installation to receive a 10% discount. Call 131149 to book or find out more! So you want super contrast and 3D? Did you know that most brands 3D glasses are limited to 1,200:1 contrast. Get more than the numbers on the box, get the real information at HCC. 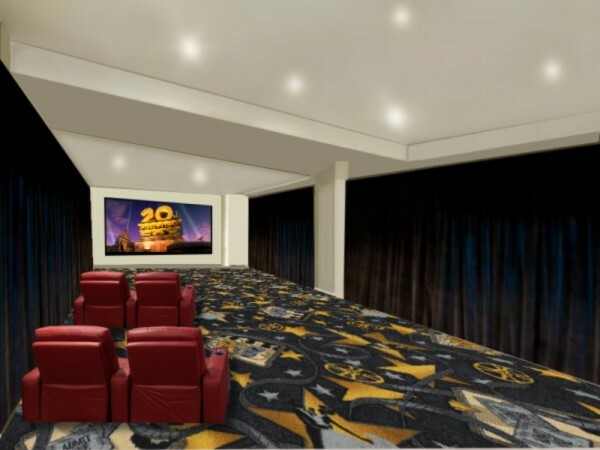 HCC is now 100% a reviewer and installer of home & corporate cinema systems. New concept room (Appointment only) so we can show what finished results will look like. Flat Screen TVs can be big heavy mirrors! A friend of our asked "What do you think of the picture" and we didn't have the heart to tell him that his new 60 inch 4K TV was hopeless compared to a projector, at least in the way he was using it. It was an LG but all brands would have the same problem. The first thing we noticed was the massive reflections of the windows in the room. The movie playing from Netflix (StarWars) was so pixelated it seemed the 4k was making it worse. The screens or wall that is, also projectors generally seem to handle low res content better. Projectors offer an IMPRESSIVE sized image for the same money or less money that you'd spend on a 60 inch mirror! Home Cinema / Theatre - Gaming Projectors what's best? We're often asked "what is the best projector" the answer depends on your situation. If you've got a well lit or bright room, say a business or board room or lounge room (that's not light controlled) you'll need a brighter projector (more ANSI lumens) than one designed for the lounge or home theatre. Sound systems are the same, there is not one that's right for every situation. If you're after a very good system to go with a top line projector in a home theatre please contact us for a bundle price including delivery. The Projection Screen can make a big difference too. The size and aspect ratio of the screen relates back to the projectors specifications, location and the lighting.